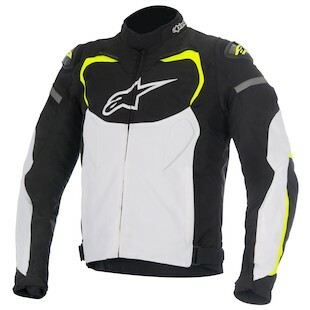 What’s better than the Alpinestars T-GP R Air Jacket? Why, the Alpinestars T-GP Air Pro Jacket of course! The T-GP Pro Air Textile Jacket is a new addition to Alpinestars spring lineup, and it really puts the Pro in protection and the T in Textile (Haha…eh). It will stand alongside the Alpinestars T-GP Pro Textile Jacket as its sportier, hot-weather brother that covers for you when your leather parents are out of town. Confusing naming conventions aside, the new jacket adds an extra level of sporty protection to highly-ventilated hot weather comfort. Alpinestars is providing an answer to folks that ride in high temperatures but would rather not compromise their protection. Mesh ranges in abrasion resistance from a pair of perforated basketball shorts to a gently-used kleenex, so they smartly place the panels out of the way of impact areas; those are instead covered with their 600D polytextile, with some perforation just below the shoulder plates on either arm. They also include CE certified and highly breathable Bio-Air shoulder and elbow protectors, which are flexible and netted for maximum air-flow. Knowing the importance of protection to their target rider, they also include compartments to upgrade back and chest protection. For increased mobility, they add an expanse of accordion stretch inserts at the elbows and shoulders. Lastly and most surprising are the addition of TPU shoulder sliders, historically an appointment only added to race leathers, that elevate the aggressive look and the protection in a slide. The only real downside to the jacket I found is its complicated name losing it a bit in the line-up. This jacket is going to be available in 3 colorways, including the subtle all-black with white accents, the sporty black/white/red colorblocking, and another black/white with hi-viz yellow accents. Regardless of your flavor of T-GP, the T-GP Pro Air is worth a high five and a good look.